Dr Corey Bergeron is a native of Breaux Bridge where he lives with his wife Patty Landry Bergeorn and his daughter Kennedy. He graduated from St Thomas Moore Catholic High School in 1992. He then attended UL Lafayette where he received a bachelors degree in biology and a minor in chemistry. 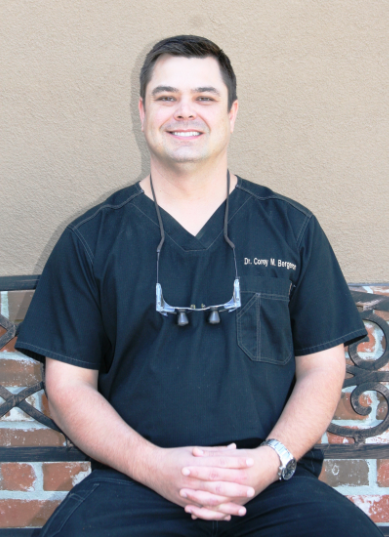 In 1997 he applied and was accepted into LSU School of Dentistry in New Orleans where he began his dental training. In 2001 he received his Doctor of Dental Surgery(DDS) degree finishing with honors having a 3.6 grade point average. After graduation, Dr Bergeron continued his education with a one year residency at the VA Hospital in New Orleans. There he received additional training in oral surgery, restorative and various other dental procedures. During that time Dr Bergeron was also building his dental office which was completed in August 2002 when he began practicing at his current location. In 2006 Dr Bergeron traveled to Oklahoma City where he completed a residency at the McGarry Institute for Implant and Prosthetic Dentistry. During the residency he furthered his knowledge and skills on surgical placement and restoration of dental implants.